*Pants have hair on front and back. Find your local powder stashes or enjoy a cold, sunny day of ripping groomers in the Mountain Hardwear Highball Insulated Pant. 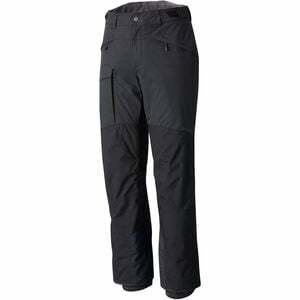 This lightly insulated pant thrives when worn on resort days when you need to stay dry, warm, and comfortable. To ensure you can slash powder, cruise groomers, and endure long snowy chairlift rides while staying warm, the Highball is equipped with a two-layer construction called Dry.Q. This material is breathable and waterproof to keep you dry both from your sweat and from outside moisture. At the same time Thermal.Q insulation helps trap heat without adding excess bulk or weight. Additionally, large inner-thigh vents allow you to dump excess heat and a built-in Recco rescue reflector can be picked up by beacons in the case of an emergency.